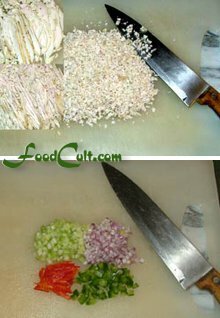 Let's go make some fantastic Chicken OR Turkey Salada! Finely dice (or mince) cooked meat. Finely dice onion to 1/8" (3 mm) to 3/16" (5 mm). (Optional): Finely dice other vegetables as prefered (we like the crunch of celery). Start by adding 1/4 C finely diced vegetables. Stir dry ingredients gently so as not to mash or otherwise pack the meat. Add additional vegetables gradually until you reach your prefered ratio of vegetable to meat. Add 1 Tbs mayonnaise, 1/8 tsp salt, 1/8 tsp pepper, and 1/2 Tbs finely minced fressh (or dry) parsley. Using the fork, stir gently until the mayonnaise is spread through the mixture (Stir from the bottom up to avoid mashing or otherwise compressing the dry ingredients). Add mayonnaise, 1 tsp at a time - stirring well, until the desired texture is reached. Carefully add additional salt, pepper and finely chopped fresh or dry parsley - to taste. Use the left-over bits of chicken and/or turkey ... Those small pieces that seem not so good for very much tend to be nice and soft and filled with flavour for a delightful chicken or turkey salad. Always stir ingredients from the bottom up to avoid creating a hard or pastey salad. Add final amounts of seasoning in small amounts at a time so as to avoid over-seasoning. 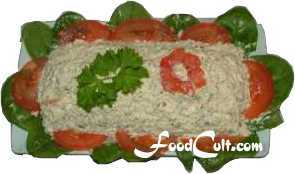 Chicken salad is one of those great dishes that satisfies as a snack or participates in a wonderful, deli-style meal. Serve it on bread, in pita or with crackers. A small bit wrapped in a piece of lettuce is low-carb and wonderfully refreshing. On the sub-continent we had, in a hotel, American chicken salad. It was diced (to 3/8 inch cubes) chicken with a thin mayonnaise and some celery. They must have gotten the idea from somewhere! Chicken salad can be made with mustard mayonnaise, with no vegetable, with peas - there are so many variations and, as with so many other fine foods, they're all wonderful to somebody. This recipe is for a relatively conventional, western chicken salad with minced chicken. Where you will find it differs is in the approach to vegetables. We think of chicken salad as a salad - replete with a selection of fresh vegetables. These vegetables contribute flavour, texture and a sense of freshness to the dish. You should experiment - discover what makes, to you, great chicken or turkey salad. What we pictured here are our favourite additions to chicken salad served on a bed of spinach with sliced tomato and some flat-leaf parsley.